Via Scoop.it I came across various interesting articles on Conscious Business and Conscious Capitalism. Especially, the following beautiful illustration reminds me of Abraham Maslow's famous needs-pyramid. I have always been intrigued by Maslow's pyramid and how to 'transcend' from basic needs all the way up to the elusive-sounding "self-actualization". 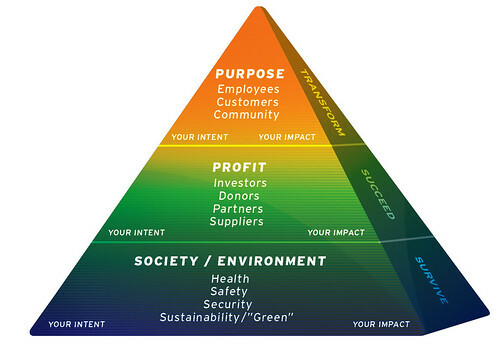 Wouldn't it be great to have a similar, clear hierarchy and pyramid for the evolution of business and capitalism? Read the full article at Maddock Douglas and explore more on the topic via Scoop.it where also my own article about Conscious Business is featured.